SOLD OUT. There is still space on the 2019 European Anabaptist Heritage Tour! Or ask to be placed on the waiting list for the 2020 tour. This European heritage tour traces the Anabaptist/Mennonite story through Germany, Austria, Switzerland, France, and the Netherlands. Visits to significant sites will bring to life the stories of Jakob Amman, Martin Luther, Michael Sattler, Pilgram Marpeck, and many other Reformation and Anabaptist leaders. Other tour highlights include: an afternoon cruise on the Rhine River, a visit to the Rijksmuseum, climbing into the foothills of the Swiss Alps to the Cave of the Anabaptists, visiting Trachselwald Castle, riding a cable-car up a mountain, and visiting the Weierhof, a semi-communal Mennonite village. Historian and experienced tour leader John Sharp will share insights as you travel in these beautiful countries that were so important to our Anabaptist ancestors. This tour can be paired with once-in-ten years Oberammergau Passion Play tickets & a 2-night hotel stay, August 10-12, 2020. PLAY TICKET PACKAGE MUST BE BOOKED ASAP. Whether you’re coming from North America or from Oberammergau, meet the rest of your fellow travellers in Munich, Germany. 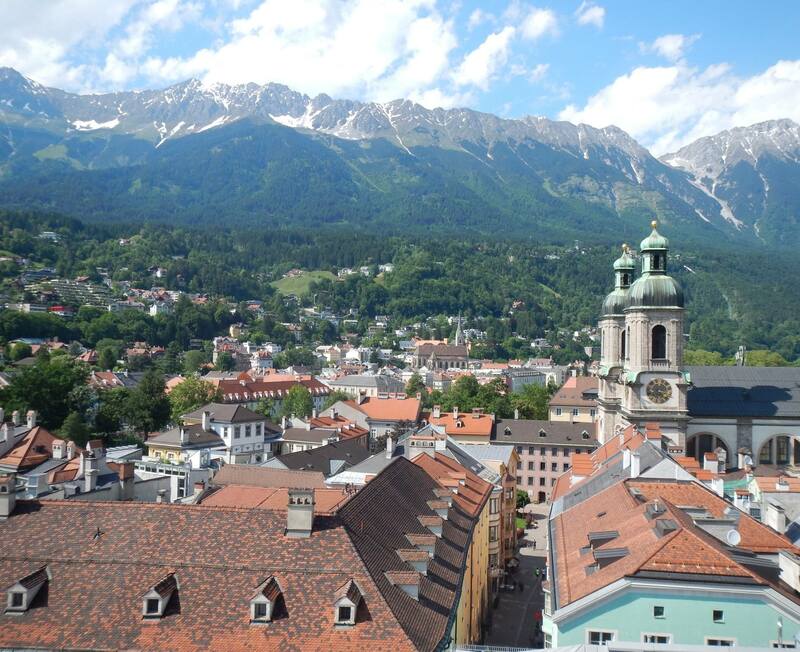 Travel together to Innsbruck, and learn about the Jacob Hutter Anabaptist story in Innsbruck. Also, enjoy apple strudel on the famous Maria Theresien Strasse. In nearby Rattenberg, hear about Pilgram Marpeck, the Menno Simons of the South, who left his home to escape arrest as an Anabaptist. See the house where Marpeck lived, which today has a lead crystal blowing centre and store. Visit Hutter Park in Innsbruck to see a memorial to Anabaptist martyrs—twelve boulders arranged in a circle to represent the communal life of the Hutterites. Tonight you can attend an optional Tyrolean folk show to experience authentic local music, dancing, and more. On your way to Zurich, stop for lunch at St. Gallen, the city of Conrad Grebel’s famous brother-in-law Vadian. Spend time in Zurich for an Anabaptist walking tour of sites related to the birth of Anabaptism in 1525. Take a wagon ride up the Anabaptist climb (Täuferstieg) near Schleitheim where the first Anabaptist confession was written in 1527. Reflect at a unique monument placed in 2004 by Reformed Church leaders as an act of repentance and reconciliation between Anabaptists and their former persecutors. Next, visit a former secret worship site, the Anabaptist Cave at Bäretswil, for worship and reflection. Cross the Sustenpass into the Emmental and Bern Canton and join in Sunday worship at a local church. See the Langnau Mennonite Church, the oldest in the world, and look for familiar names in its cemetery. Hopefully experience the hospitality of a local Mennonite family by sharing lunch together in their home. In the Emmental region, visit other key sites including Trachselwald Castle, a fortress once used to imprison Anabaptists. Also stop at Yoder cave, if time permits. See the historic Reformed church at Würzbrunnen which has an abundance of Anabaptist stories. Begin the day with a walking tour of Bern. Then learn more of the Amish story in the heart of their homeland. Visit Thun. Tour the church at Erlenbach in the Simmental where Jakob Amman was baptized. At a cemetery and Reformed church in Steffisburg, learn about connections with the Amish. Finish the day by taking a cable car up the Stockhorn mountain for fabulous panoramic scenic views. See medieval and early Renaissance art in the Unterlinden museum in Colmar. Have lunch in the quaint town of Riquewihr, known for its narrow streets and half-timbered houses, then continue on the wine route to the Alsace region where Jakob Amman lived to hear more of the Amish story. Travel to Strasbourg where Pilgram Marpeck was a leader of the local Anabaptists to learn more of his story. In the Palatinate region, visit the semi-communal Mennonite village of Weierhof, including the Mennonitische Forschungsstelle, Germany’s only major Mennonite archives. Have lunch in Worms where you’ll visit the Luther Monument and learn about the Reformation. Relax and enjoy the scenery on a Rhine River cruise from Boppard to Oberwesel. Continue to Köln for the night. Visit Köln’s twin-towered Gothic cathedral. In Münster, take a walking tour to gain greater insight into the darker times of Anabaptist history. Hear about the violent uprising of radical Anabaptists during the Münster Rebellion. See the cages that were once used to imprison Anabaptist leaders which still hang from the St. Lamberti Church tower today. Visit the city museum with its Anabaptist room. During free time this afternoon, optional activities include visiting an outdoor museum or renting bikes to ride around the old city. In the evening, meet Maartja Salje, the city’s tower keeper. In Friesland in the Netherlands, learn about the Menno Simons story with stops at the hidden church at Pingjum, and the Menno Simons monument at Witmarsum—the village where he was born. Visit Leeuwarden. Tonight, enjoy the hospitably of locals with homestays in Berlikum. Worship with the Mennonite believers of Berlikum this morning, then cross the 22-mile Afsluitdijk. Visit Zaanse Schans, a historic Dutch village with traditional houses, working windmills, and artisans crafting things like wooden shoes and cheese. Finish the day’s explorations with a visit to Asperen to hear the story of Dirk Willems. Tour the impressive Aalsmeer flower auction where 20 million flowers from around the world are traded daily! Browse the Rijksmuseum, known for its collection of Dutch Golden Age works, to see pieces by world-renowned artists like Rembrandt, Vermeer, and Jan Steen. Be sure to see the museum’s collection of Mennonite works too. Then climb aboard a river boat for a leisurely tour of Amsterdam’s canals. Say farewell to friends old and new as you depart for home from Amsterdam.